Seller: aurelius1962 (5,945) 100%, Location: ..................., Ships to: Worldwide, Item: 323415938431 Censer A 008 – OUTSTANDING ENORMOUS ANTIQUE 1800s. 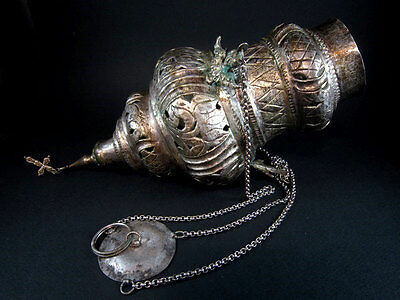 RUSSIAN ORTHODOX SILVER CENSER-BURNER!! !You are bidding on an Antique 1800s. Genuine Censer-Burner used in Orthodox Christian rituals in Russia. It is made from low grade silver mixture and amazingly decorated perimeter. Decoration is consisted by three Angel busts with wide open wings, made in very realistic style and religious patterns, themes inspired by Old Byzantine Art. A beautiful oval plate with loop is placed on the top to hold the chains. Perfect for use at home or church. Amazing style and metal work. Excellent and RARE type censer Lampada!!! It is in as found condition and still with some green and brown deposits remaining on the surface. There are some minor cracks but it is stable. Small nice cross is hanging under. I think the loop, chains and one of the Angels are replaced later in time. This would make a great addition to any collection.In order to use, place a piece of charcoal inside, light it up and then add a couple of frankincense stones on the coal.Size of the canser:270/105 mm; Size with the chain: 520 mm; Weight:265 g; Authenticity Guaranteed 100% +++ Condition: As found condition!! !, Provenance: Ownership History Not Available, Material: Low grade silver mixture!!! Popularity - 0 views, 0 views per day, 235 days on eBay. 1 sold, 0 available. 1 bid. 0 views, 0 views per day, 235 days on eBay. 1 sold, 0 available. 1 bid.